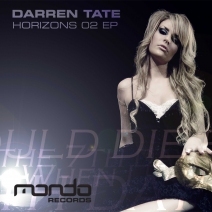 Mondo Records is proud to present the second instalment to the already huge 'Horizons' album series from master producer Darren 'DT8' Tate. "I Would Die For You" features the stunning vocals of Pippa Fulton and is a dance floor bomb that comes in not one but two stunning guises; the original mix is a progressive-trance bomb that oozes atmosphere and is guaranteed to rock any system, and the Jurgen Vries mix is a spine-tingling club moment for the peak time sets. "When I Fall In Love" - Some might say Daft Punk and others Chemical Brothers but this is a truly original electro-breaks-house mash up with a singing droid and live strings. This is addictive listening and despite it's dark and twisted club nature has got real crossover potential. "On The 7th Day" - On the more progressive, longer player tip. "On The 7th Day" is an atmospheric, thoughtful and uplifting piece of music that might be something for you. Already huge support from Above & Beyond on TATW!